PAPUA New Guinea produces various raw talents in rugby league or sports in general but to market these talents requires capital. Rugby league talents that played in the past, currently play or are yet to play with the PNG Hunters must realise and appreciate the efforts from corporate houses, PNG Hunters chairman Graham Osborne, pictured, said. 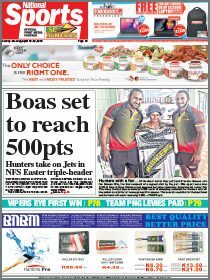 Osborne shared his appreciation for the PNG Hunters sponsors on behalf of the Papua New Guinea Rugby Football League board at the launch of the Hunters’ 2017 season last week in Port Moresby. Osborne referred to the sponsors, who made it possible for the Hunters to participate in the Intrust Super Cup as a family reflecting on the growth of the relationship since the Hunters inaugural year in 2014. “We want our sponsors to know that they are family to us,” Osborne said. You have been with us for four years and you have played a big role in the growth of the Hunters,” the New Zealand-born restaurateur said. Osborne said with support from the sponsors from the corporate sector hand in hand with the National Government and the responsible sporting federation the level of rugby league has grown with the marketing of players through pathways overseas. He said Kato Ottio, Justin Olam and others were examples and sponsorship was the cornerstone of the process in a profit-driven society which the people of PNG needed to appreciate. 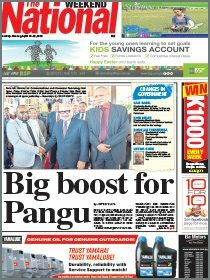 “With the support we can see that we have the Hunters in the Intrust Super Cup, wonderful world class venues and for the first time PNG will be hosting three games of the 2017 Rugby League World Cup,” he said. PNG Hunters sponsors include the South Pacific Brewery, National Gaming Control Board, PNG LNG, Air Niugini, Boroko Motors, Coca-Cola Amatil, FI-TA and Digicel PNG.